View More In Cooking Utensils - Page 4. Messermeister, featuring premier German cutlery, has roots in both Germany and Australia. Today, Messermeister operates as a U.S. company that strives to provide the highest quality of cutlery and culinary tools to both food-service professionals and home. We are committed to designing new and innovative products and sourcing the world to find the very best quality at the right price for the market. Messermeister products are all fully warranted for the life of the user against defects in materials and workmanship. 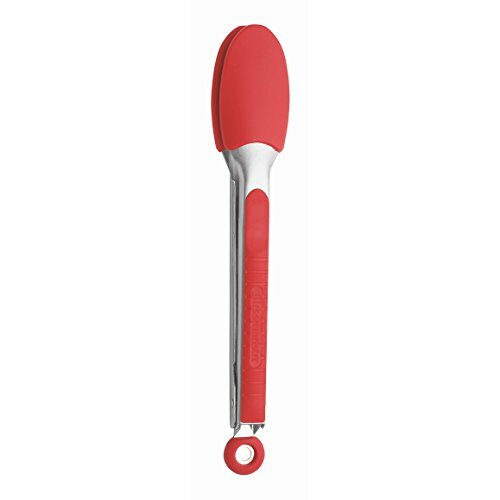 This red 9-inch stainless steel and silicone locking tong have a silicone tip and handle which protects cookware from scratches and provides a sturdy non-slip grip. Made with a stainless steel body and rivet, this Messermeister tong has a durable locking mechanism and spring, which is the strongest on the market. Used by culinary professionals everywhere, tongs are ideal for tossing salads, pastas and vegetables and is the perfect tool for turning meat. Keep locked in a closed position for convenient storage. Heat resistant up to 430-degree F and dishwasher safe.